With the large deficit our country is facing, politicians are starting to get creative. There’s actually been some talk about getting rid of the mortgage interest deduction for homeowners. If you don’t own property, then you may not know about one of the biggest tax deductions available. The mortgage interest deduction allows taxpayers who own their own home to deduct the interest paid on their loan from their taxable income. The interest is deductible on the first $1 million of home acquisition debt and $100,000 on home equity debt. In order to take advantage of this deduction, taxpayers need to calculate if their itemized deductions will be greater than the standard deduction on their Schedule A form. Younger homebuyers need to take this into account when planning out if buying a house is right for them. The NRA(National Realtor Association) loves to tell homebuyers how much they will save in taxes by buying a house. While this may be true, with lower home values it may not be as much as you think. The mortgage interest deduction is one of the best tax deductions out there and will almost immediately allow you to itemize your deductions, reaping the benefit of property tax deduction, medical expense deduction and charitable contribution deduction among others. Your CPA will love you and you will love him once you buy a house. A lot of deductions open up to homebuyers, but for property values in the sub 500k range, the deduction may not be as great as you think. Single taxpayers in 2012 are automatically granted a standard deduction of $5,950. When you itemize your deductions you lose this standard deduction. This might not make as much of a difference to someone with an 800k mortgage but when your mortgage is only 200k, removing the standard deduction will have a big impact on your finances. Jay the homebuyer buys a property for $300,000. He puts down 20% and locks in a 3.75% 30 year fixed loan. On a $240,000 loan, Joe will pay $8,924.67 in interest after his first year. Let’s assume he makes $75,000; that would put Jay in the 25% tax bracket federally(we’ll ignore state taxes and FICA, Medicare, SS for simplicity). 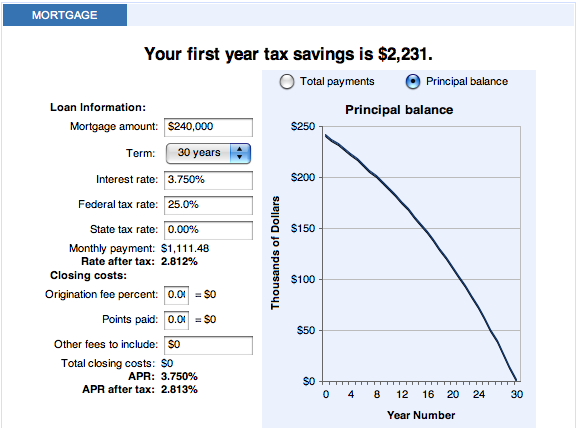 When I enter all this info into the mortgage interest deduction calculator on bankrate.com it tells me my first year tax savings is $2,231. Wow, that’s awesome! The only problem with this number is it’s not true. Although you’ll be reducing your AGI by $8,924.67, you would have received the standard deduction of $5,950 without this. So your true savings is the difference between the total interest paid minus the standard deduction times your tax bracket. In this case, Jay is in the 25% tax bracket, so ($8,924.67 – $5,950) x 25% is $734.67. So in this case, your monthly savings is only $734.67 from the mortgage interest deduction and that’s a lot different than $2,231. The Mortgage Interest Deduction is Still a Good Thing! If you consider property tax deduction, which goes hand in hand with the mortgage interest deduction, you’re able to deduct an additional 1% of the purchase price(assuming property tax is 1% of purchase price). In the above example, this would be an additional deduction of $3,000. But the key point to remember here is that you need to subtract the standard deduction from the total interest and property tax paid in order to get an accurate calculation of your savings. The mortgage interest deduction is still a great benefit to taxpayers, but make sure you’re adding it up correctly. It ends up saving me around $125 per month on my taxes and it allows me to deduct all of my charitable contributions. As you get closer to the $1,000,000 limit, this will become less of an issue, but until then, I hope the government doesn’t get rid of one of the best deductions around. 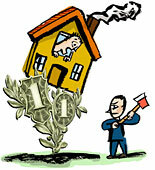 Readers, have you taken this into account when adding up your tax savings from buying a home? Do these calculations makes sense or did you conservatively ignore this deduction? and it shows something less than $100 of tax savings per month, far less than what I originally thought (~$300 per month). Thanks for the tip. Yea I got tired of hearing all these realtors and brokers saying how much you save by buying a house! There is still the property tax deduction, but as you can see the true savings can be a couple hundred less per month. I think the true savings on buying my condo is that I didn’t pay any closing costs and that my monthly carrying cost went down $200/month from what I was paying while renting. With the amount of mortgage that I took out, I don’t see myself getting much back in income taxes by way of the interest deduction, even if I wasn’t pre-paying the mortgage at all. It would *maybe* amount to a $1k/year tax savings, but on a $20-30k tax bill, that’s really not that much savings. Pre-paying your mortgage reduces the amount that you pay in interest and since your income tax deduction is based on the amount you pay in mortgage interest, if you pay less in mortgage interest, you save less in taxes, no? Ah I was wrong! I researched it and found that while the prepayment will not change the amount of the borrower’s regular monthly payment, it will change the manner in which the monthly payment is applied toward interest and principal. Your interest is calculated each month (or day), so even though the payment remains the same, by pre-paying, you are causing the split between interest payment and principal payment to happen quicker. So, even though the interest rate and payment are the same, you pay less interest, thus less tax deduction. You’re right Zack, thanks for the clarification. I updated my comment above to reflect that! This article is a little too simplistic. When you start itemizing deductions, you lose the standard deduction, but you also pick up other itemized deductions like charitable contributions and property taxes. Hi, thanks for stopping by. Property tax is definitely something to consider, but my main point is to show that you need to do the calculations yourself. Just because a realtor tells you that you’ll save $200 a month in taxes does not make it so. I would rather calculate it all myself than have it be a surprise once I buy a property and tax time rolls around. This certainly isn’t the right way, either. My standard deduction (head of household) is $8500. So you would look at it as if I can deduct and extra $418 by using my mortgage, and 25% (my tax bracket) of that is just over $100. My standard deduction is $8500. My interest (plus extras for doing it this way) is about $17500. So my savings is 25% of $9000, or about $2,250. Much better than $100. Thanks for stopping by Bill. Obviously every situation is different, if you didn’t have the extra deductions you would be a lot closer to that standard deduction number and you would be saving very little money tax-wise by buying a house. The whole point of this exercise is to show that you shouldn’t believe the numbers that realtors tell you. Let’s say I was a realtor, I would tell you that you’ll be saving about 25% x $8,500. That would actually be under-estimating your deduction. I always recommend that you add up your interest deduction, property tax deduction, charitable contributions, etc. and then compare that to the standard deduction. The Mortgage Interest deduction itself is immoral. It is a perfect example of a tax policy designed to narrow the tax base. Only individuals who own homes (and multiple homes), i.e. not low income families, are able to benefit from the tax break. While the tax break decreases the progressivity of traditional marginal tax rates, it hurts consumers through higher property values. In areas where land and property are faced with strict zoning laws and the amount of area available for new construction and houses is limited, see dramatically higher prices in owning and renting homes. i.e. cities (San Francisco). Thus making it more difficult for lower income households to purchase their dream home. Real house prices driven down by tax break, driven up by increased demand and inability to increase supply. Impact of deduction on purchasing ability is minimal for average consumer, non-home owners are made worse off through higher rents. Additionally, many lower and middle income homes which do own homes, do not itemize their taxes due to simplicity or value of the deductions is less than itemizing. Thus never able to capture the benefits. The only difference is high income consumers with multiple and high-end homes looking to shield their tax base from taxes. David, thanks for the comment. Even though my taxes would go up in the short term, I am in favor of getting rid of all tax deductions above a certain income level(ie poverty line). It’s definitely the wealthy who take advantage of this deduction but that doesn’t mean it still won’t save people like you and I some money.